Cured in Wiltshire the Traditional Way. 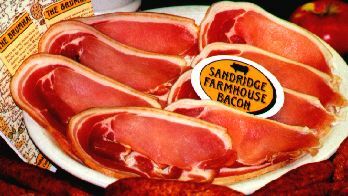 Sandridge Farmhouse Bacon are Traditional Curers of Wiltshire Bacon, Naturally Smoked Bacon, Dry Cured Bacon, Speciality Hams and Pork Sausages. The Keen Family farms on 350 acres in Wiltshire, their Bacon and Hams are produced from pigs bred and reared at Sandridge farm. Sandridge Farmhouse Bacon, Hams and Gourmet Gift Packs can be purchased from Farm shops, through Independent Local Butchers and Delicatessens or Farmer's Markets.